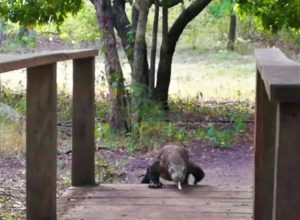 Logan had warned me about the risks of a Komodo Dragon encounter. Normally, he adores animals; we often call him the “Beastmaster.” When he was younger, he used to lug a thick, illustrated animal encyclopedia with him from room to room. Over the years he had memorized an extraordinary amount of anecdotes about all kinds of creatures. But what he had read about the dragons had clearly terrified him. In short, the dragons are big, weird and fearsome beasts. They may spend a lot of time laying around, but as we had just experienced, they are not docile. They can smell blood from 5 km away, get very aggressive when they hunt and like to ambush prey from the tall grass. They can also eat their own body weight in a single meal. To them, my boys would look like a 4-pc McNuggets set. 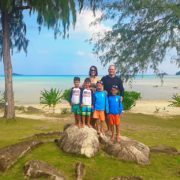 My biggest concern was that the boys would think they were just bigger versions of the skittish monitor lizards we chased every weekend in Lumpini Park, Bangkok. 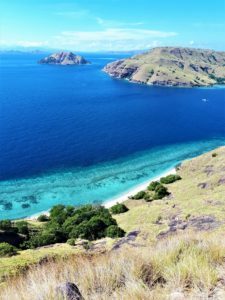 The dragons live on a handful of adjacent islands: Flores, Komodo, Rinca, Gili Motang and Gili Dasumi. 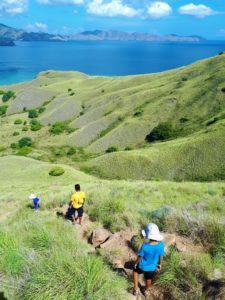 But there are only two official (read: safe) places within the park where you can join guided treks to see them: Loh Liang on Komodo and Loh Buaya on Rinca. The Internet is full of conflicting and probably spurious opinions on which place is better for encountering dragons, e.g. 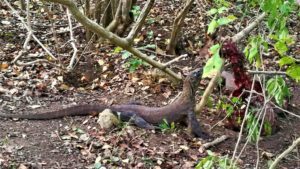 “the dragons on Komodo are bigger…but the dragons on Rinca are more aggressive.” We saw dragons at both locations. I think you’d be very unlucky to not see any. Overall, we preferred Rinca for its varied landscape and incredible views. But when you’ve come all this way, why not visit both? 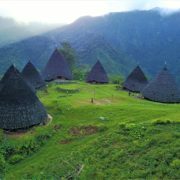 Dragons and scuba-diving bring people to Komodo, but the trekking deserves equal billing. The trails were steep and exposed to the brutal sun, but the views were glorious. 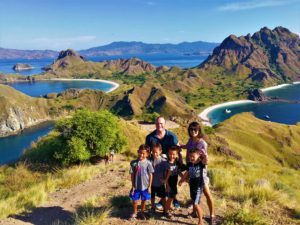 On Padar Island, we joined dozens of tourists for the very popular 30-40 minute hike up a ridge offering views of four beaches, castle-like peaks and distant islands. 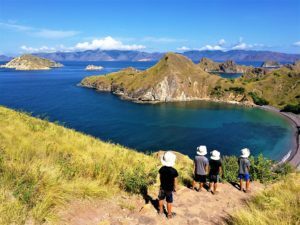 Later that day, I went wild hiking on the north end of Padar. Captain Adi claimed that Padar still had dragons, “but normally not in this area”. Just to be safe, the guide and I both found sturdy walking/dragon sticks anyway. As we laboured up gravelly inclines and bashed through spiny brush, we startled a herd of Timor deer – the dragons’ favorite repast. Following them up a game trail to a boulder-strewn bluff, we got a completely different perspective of this incredible island. 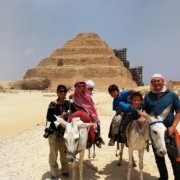 The guide nodded appreciatively. “I’ve never been here before,” he said. I could see my family playing on the beach far below. 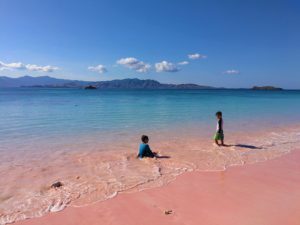 From here, a narrow ribbon of wet sand between the blue water and the white beach was as pink as a scoop of strawberry ice cream. We loved our boat. The Carpe Diem had three separate cabins, each with a small bathroom and air-conditioning unit. The main deck was upstairs, just aft of the pilothouse. This was where we spent most of our time. It had a small, covered lounge for dining and relaxing and a large, open area with bean bag chairs. The upper deck was also encircled by a wooden railing, perfect for the boys to jump off. 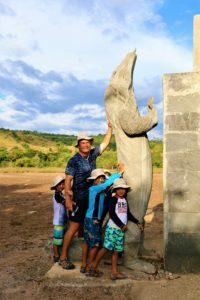 The excellent crew was led by Captain Adi, who did a great job meeting our request for quiet, off-the-beaten-path beaches and hiking trails. 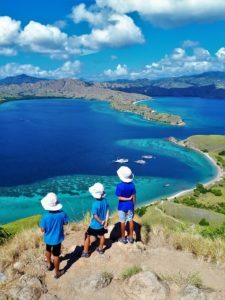 On our last morning in the islands, I trekked with three of the four boys to an extraordinary viewpoint atop Gili Lawa Darat. 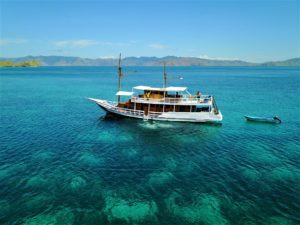 A skeletal finger of Komodo Island extended to within a few hundred meters of the the island, creating a circular near-lagoon with breathtaking blues at its coral-lined edges. The boys were wowed by the vista and proud of making it on their own. 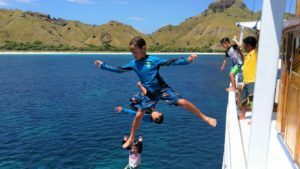 As in the Mergui Archipelago, “abandon ship” became the boys’ favorite pastime. They spent hours leaping off the boat into the water. 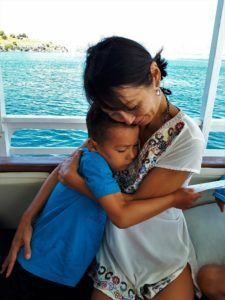 Currents can be very strong in Komodo, however, so the boys (and the crew) were nervous at first. But they are excellent swimmers and were wearing life-jackets, so I wasn’t worried. Logan, of course, went first and screamed “this is so awesome!” once he climbed back onboard. 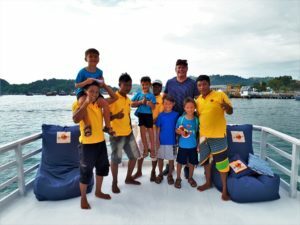 Soon all the boys were “current bombing”: jumping off, popping up quickly and then paddling vigorously to the ladder before the current swept them past the boat. 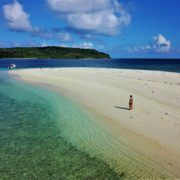 As remote as Komodo National Park was, we were rarely alone. 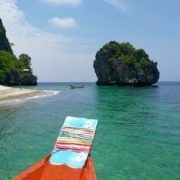 During the high season (May-Aug) there are dozens of vessels on the water – from floating backpacker dormitories to luxury sailboats. 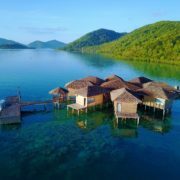 And while there are 29 islands in the archipelago, most boats visit the same 5-6 places in a clockwise loop, resulting in traffic jams and crowded moorings at the popular spots. It isn’t Halong Bay – at least not yet – but it can be dispiriting to travel so far and find yourself following the same boats from site to site, day after day. 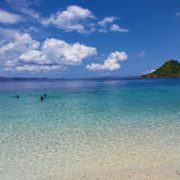 For instance, nearly all itineraries include a stop at Pink Beach on Komodo Island. It’s around the bay from Loh Liang and is on the way to Manta Point. 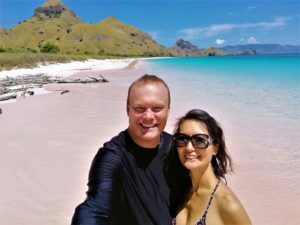 It’s beautiful, but it can get very crowded, and as we discovered, it’s not the only pink beach in Komodo National Park. 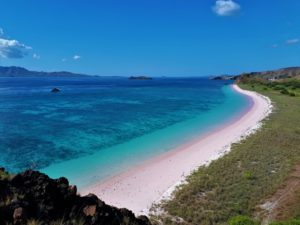 In fact, most of the beaches on northern Padar have a pink fringe. That’s the huge advantage of chartering a boat. 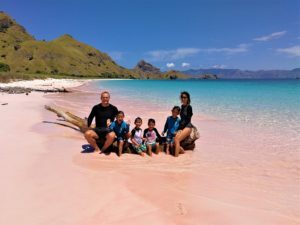 We were all having such a great time jumping off the boat, snorkeling and playing on the beaches of Padar that we decided to stay the whole afternoon. 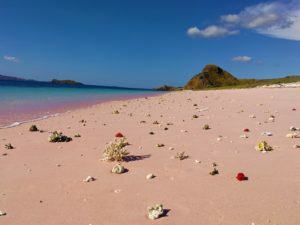 While I was hiking, the kids solved the ‘mystery’ of the pink beaches. They found little knobs of crumbly, bright red coral washed up on the shore. The beach was still mostly white, but the coral grains were enough to make it blush. 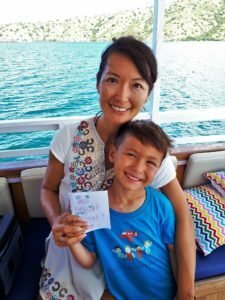 On the morning of Nori’s birthday, the boys gave her homemade cards and bear hugs. Being the mother of two sets of twin boys is exhausting. And she makes things even harder on herself by always trying to do and see so much. But when the day started with four warm embraces from little humans she made, I could tell that she felt really feel blessed. And that was just breakfast. 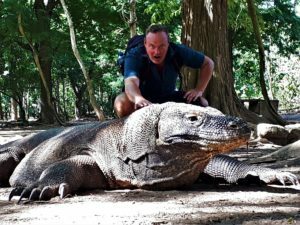 Later that morning, she walked with dragons on Komodo Island. After lunch, she swam with manta rays. 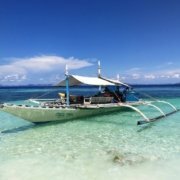 And in the late afternoon, she snorkeled above an incredible reef at Gili Lawa Laut. That evening, the sunset was remarkable and the stars turned out in force. “Not a bad birthday, huh?” I asked, knowing the answer. “Yeah, I don’t know if this can be beat,” Nori replied.